Soil – Soil Types: Sandy – Clayey – Loamy. 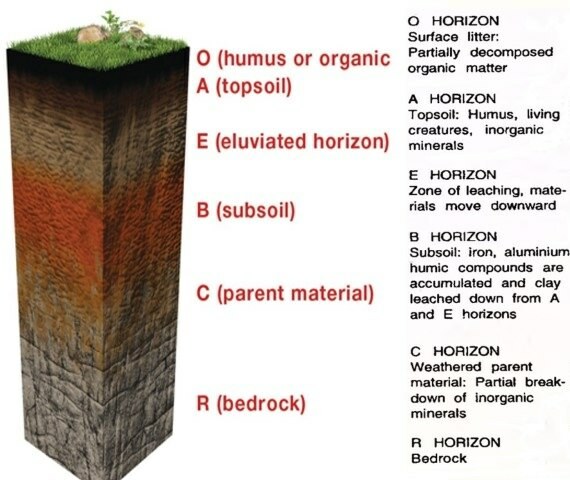 Soil Profile – Soil Horizon: O horizon, A Horizon, E horizon, B Horizon, C Horizon or Parent rock, R Horizon or Bedrock. Soil is the thin top layer on the earth’s crust comprising rock particles mixed with organic matter. Pedology is the study of soils in their natural environment. Pedogenesis is the natural process of soil formation that includes a variety of processes such as weathering, leaching, calcification etc.. The Soil formation is mainly related to the parent rock material, surface relief, climate and natural vegetation. The soil is classified on the basis of the proportion of particles of various sizes. Water can drain quickly through the spaces between the sand particles. So, sandy soils tend to be light, well aerated and dry. The best topsoil for growing plants is Loamy soil is a mixture of sand, clay and another type of soil particle known as silt. Silt occurs as a deposit in river beds. The size of the silt particles is between those of sand and clay. The loamy soil also has humus in it. It has the right water holding capacity for the growth of plants. A soil horizon is a layer generally parallel to the soil surface, whose physical characteristics differ from the layers above and beneath. Horizons are defined in most cases by obvious physical features, chiefly colour and texture. Layers dominated by organic material. Some O layers consist of undecomposed or partially decomposed litter (such as leaves, needles, twigs, moss, and lichens). They may be on top of either mineral or organic soils. It is the part of top soil. In this layer, organic matter is mixed with mineral matter. It is the layer of mineral soil with the most organic matter accumulation and soil life. This layer is depleted of (eluviated of) iron, clay, aluminum, organic compounds, and other soluble constituents. When depletion is pronounced, a lighter colored “E” subsurface soil horizon is apparent at the base of the “A” horizon. “E” stands for eluviated layer. It is the horizon that has been significantly leached of clay, iron, and aluminum oxides, which leaves a concentration of resistant minerals, such as quartz, in the sand and silt sizes. These are present only in older, well-developed soils, and generally occur between the A and B horizons. It is subsurface layer reflecting chemical or physical alteration of parent material. This layer accumulates all the leached minerals from A and E horizon. Thus iron, clay, aluminum and organic compounds accumulate in this horizon [illuviation (opposite of eluviation)]. Weathered parent material accumulates in this layer, i.e. the parent material in sedimentary deposits. It is a layer of large unbroken rocks. This layer may accumulate the more soluble compounds (inorganic material). This layer denotes the layer of partially weathered bedrock at the base of the soil profile. Unlike the above layers, R horizons largely comprise continuous masses of hard rock. Soils formed in situ will exhibit strong similarities to this bedrock layer. These areas of bedrock are under 50 feet of the other profiles.